I think we've seen this film before. This Korean Grand Prix, in terms of the fight for victory, didn't do anything to challenge the previous direction of travel, it simply continued previous momentum. Yes, Sebastian Vettel took another win in Yeongam today, his fourth triumph on the bounce as well as his eighth of the year. And in that rather familiar way of his the result didn't look at all in question from the off, quite literally. The insulting superiority of Singapore wasn't quite in evidence - Seb only won by four seconds and indeed his lead rarely extended to much more - but somehow there seemed as little doubt about who'd be in front at the end. 'Disciplined' was how his boss Christian Horner described the drive. It was the most appropriate adjective. And what's more the result put Seb on the brink of his latest drivers' title for the collection: now being 77 points ahead with just 125 available. He can win the title next week in Suzuka, but somehow the debate seems irrelevant. It's reaching the point that even if he was to sit out the remaining rounds you wouldn't bet a great deal on anyone behind making up the deficit. Those rivals you feel rather gave up the ghost effectively a while back. 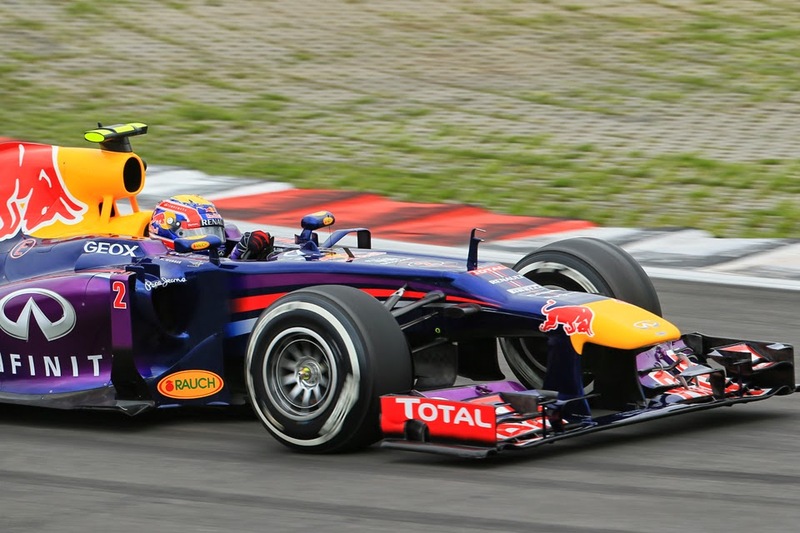 F1 in 2013 has established an unmistakable sense of drift. 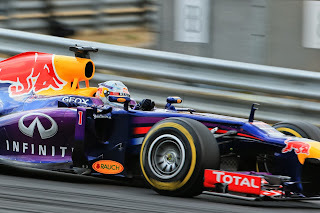 Drift towards 2014; drift towards title number four for Seb. Even the director of the TV feed for the Korean race seemed to bow to the inevitable long before the end: Seb was hardly seen on our screens today. In another reflection of Singapore though the race without Seb was a fairly diverting one, particularly in the second half. 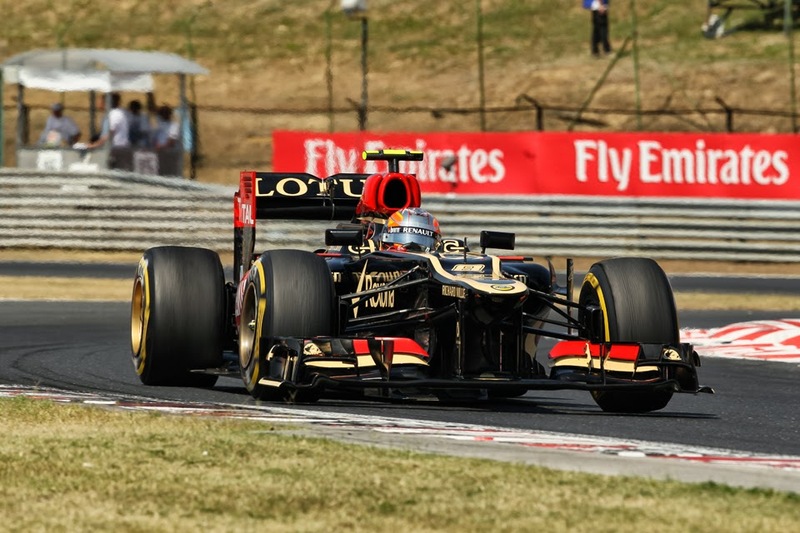 Lotus was best of the rest on race day, and Romain Grosjean was closest to Seb for much of the way. Having started third he moved smoothly past Lewis Hamilton into turn two to claim second, and then he calmly rebuffed his adversary a couple of times - in so doing displaying a new-found assurance in wheel-to-wheel situations. He looked comfortable there too, though just like in Germany a mid-race safety car counted against him somewhat. It got his stable mate Kimi Raikkonen onto his tail - who had ghosted forward on a Sunday in that way of his - and he was able to ambush Grosjean into turn one after the young Frenchman made an error. A two-three behind Seb, with Kimi ahead, is probably the best that the Enstone team could have reasonably expected from proceedings. And regardless this weekend continued Grosjean's renaissance which can be traced back to mid-year. It'll now be a travesty in Lotus doesn't retain him for 2014. But next up we had the star of this show, with the Hulk's latest incredible feat: Nico Hulkenberg finished in a scarcely plausible fourth place. Some fine race craft got him up to fifth place at turn three, and then he stayed there - even as the haughty Fernando Alonso, Kimi Raikkonen and, later, Lewis Hamilton piled up behind - defending against rare challenges firmly yet fairly. Hulk took advantage of his recently-improved Sauber as well as incredible traction out of turns one and two, but it was all just the latest demonstration that the Hulk belongs up there, that he's quick, able to think in a race as well as is calm and robust under pressure. No, I don't know why a front-line team hasn't snapped him up yet either. But, in a rare instance of justice being done, word on the Korea street is that a Lotus deal for next year is indeed close for him. If you're wondering how Lewis ended up behind, he 'hit the cliff' mid-race, losing several seconds a lap as his tyres went off and was stonewalled by his pit wall who wanted Lewis to press on in order to keep him on his two stop strategy (and then to compound things - pardon the pun - he was kept out an additional lap after his team mate Nico Rosberg pitted after his nose got loose). But while I don't want to suggest that I know better than the vast armies of clever and qualified strategists, I never understand their conclusions in these situations, when you're losing the time of a pit stop within a few laps anyway. Whatever was the case, it spoiled Lewis's day, and he followed Hulkenberg home in fifth. And behind them lay Fernando Alonso, who was even more frustrated than Lewis. He spent most of the day behind Hulk, which did little for him and meant that his front tyre wear was greater than it might have been. Alonso also however made it clear that today the pace simply wasn't there. It's tempting to think that it was a demonstration of what Singapore would have been without the demon start and the inspired mid-race strategy call. 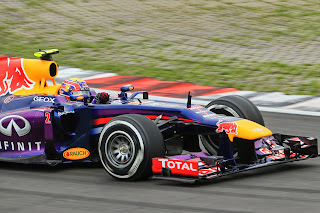 But Mark Webber was entitled to feel the most frustrated of all. Having recovered well from his grid drop he had to pit twice under the safety car, which dropped him into the pack. And then when the safety car went in he was wiped out almost immediately by an out of control Adrian Sutil, which brought Webber's race to a fiery end. He more than most you'd think would be forgiven for counting down the days to next year. The race also developed a comic caper element after a rogue fire car appeared in front on the pack during green flag conditions, with the Chief Fire Marshal apparently taking a unilateral decision to send it out as Webber's RB9 continued to burn, without telling Race Director Charlie Whiting. It seemed astonishing, almost a throwback to the 1970s when all sorts of vehicles could appear on track unannounced, particularly given that Webber was out of the car there seemed little cause for panicked reaction. We can all be grateful that there weren't worse consequences of it. What consequences there are for the race itself remain to be seen. But as far as wins are concerned - wins of races and wins of titles - the drift continued today, and it's hard to see it being arrested before next year. Of course, we shouldn't have any hostility towards Vettel or Red Bull in all of this, they are simply doing their job, and doing it better than their rivals which is the object of the exercise. And their competitive advantage is also just one of a few contributory factors to the sense of drift outlined: another is the big set of rule changes awaiting next year meaning there's more to be gained by calling of the 2013 fight as well as by now little to be gained by developing this year's cars, another still is the rather bloated and bottom-ended calendar, meaning that while it feels like most things have been decided after a long season we yet have five rounds - and close to two months - remaining. But, whatever is the case, F1 is missing something right now. It feels a little like the rest of the year will be something to be got through. UPDATE: Turns out I was maligning the Chief Fire Marshal. According to the latest reports the FIA did indeed give its blessing to releasing the fire truck, but didn't anticipate that it would be released from where it was, i.e. from turn 1 and in front of the safety car and the competing cars. It seems rather strange that the FIA didn't know where the truck was poised, but there you go. But anyway, apologies to the Yeongam Chief Fire Marshal!